Our external circumstances, including our work, income, living conditions, and educational background have a significant impact on our mental wellbeing. 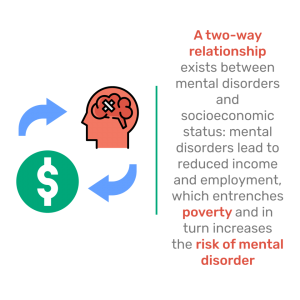 Difficulties in these economic and environmental circumstances can both contribute to, and exacerbate, mental health issues. There is a strong link between difficult socio-economic circumstances and mental health issues in children and adults. Lorant, V., Deliège, D., Eaton, W., Robert, A., Philippot, P., Ansseau, M. (2003). ‘Socioeconomic inequalities in depression: a meta-analysis’. American Journal of Epidemiology, 157(2), pp.98–112. Available at: https://www.ncbi.nlm.nih.gov/pubmed/12522017 [accessed 9 Aug. 2017]. Ansseau, M., Fischler, B., Dierick, M., Albert, A., Leyman, S., Mignon, A. (2008). ‘Socioeconomic correlates of generalized anxiety disorder and major depression: the GADIS II study (Generalized Anxiety and Depression Impact Survey II)’. Depression and Anxiety, 25(6), pp.506–513. Available at: https://www.ncbi.nlm.nih.gov/pubmed/17595015 [accessed 9 Aug. 2017]. Reiss, F. (2013). ‘Socioeconomic inequalities and mental health problems in children and adolescents: a systematic review’. Social Science and Medicine, 90, pp. 24–31. Available at: https://www.ncbi.nlm.nih.gov/pubmed/23746605 [accessed 9 Aug. 2017]. ‘Socio-economic status’ refers to a person’s wealth, employment status, level of education, and living conditions. Poverty is one major socio-economic difficulty, and the frequent cause of other problems. We know that there is a strong correlation between difficult socio-economic circumstances and mental health issues in children and adults.Lorant, V., Deliège, D., Eaton, W., Robert, A., Philippot, P., Ansseau, M. (2003). ‘Socioeconomic inequalities in depression: a meta-analysis’. American Journal of Epidemiology, 157(2), pp. 98–112. Available at: https://www.ncbi.nlm.nih.gov/pubmed/12522017 [accessed 9 Aug. 2017].Ansseau, M., Fischler, B., Dierick, M., Albert, A., Leyman, S., Mignon, A. (2008). ‘Socioeconomic correlates of generalized anxiety disorder and major depression: the GADIS II study (Generalized Anxiety and Depression Impact Survey II)’. Depression and Anxiety, 25(6), pp. 506–513. Available at: https://www.ncbi.nlm.nih.gov/pubmed/17595015 [accessed 9 Aug. 2017].Reiss, F. (2013). ‘Socioeconomic inequalities and mental health problems in children and adolescents: a systematic review’. Social Science and Medicine, 90, pp. 24–31. Available at: https://www.ncbi.nlm.nih.gov/pubmed/23746605 [accessed 9 Aug. 2017]. These circumstances can both contribute to, and result from a mental health problem:Halliwell, E., Main, L., Richardson, C. (2007). ‘The fundamental facts’. [online] London: Mental Health Foundation, p. 37. Available at: https://www.mentalhealth.org.uk/sites/default/files/fundamental_facts_2007.pdf [accessed 9 Aug. 2017].Singleton, N., Bumpstead, R., O’Brien, M., Lee, A., Meltzer, H. (2001). ‘Psychiatric morbidity among adults living in private households, 2000′. International Review of Psychiatry, 15(1/2): pp. 65–73. Available at: https://www.ncbi.nlm.nih.gov/pubmed/12745312 [accessed 9 Aug. 2017].Social Exclusion Unit. (2004). ‘Mental health and social exclusion’. [online] London: Office of the Deputy Prime Minister, p. 88. Available at: http://firststeptrust.org.uk/wp-content/uploads/2012/11/mental_health_and_social_exclusion_main_report.pdf [accessed 9 Aug. 2017]. Difficult environmental conditions often correlate with difficult socio-economic conditions, though even people who do not suffer from poverty but live in an urban environment can also experience difficult environmental circumstances. All these can be detrimental to our mental health, causing psycho-spiritual stress, and disrupting our biochemistry. Below are some examples of particularly difficult economic and environmental circumstances, and how they can affect our mental health. Homelessness is a significant contributor to mental health issues:Social Exclusion Unit (2004). ‘Mental health and social exclusion’. [online] London: Office of the Deputy Prime Minister, p. 18. Available at: http://firststeptrust.org.uk/wp-content/uploads/2012/11/mental_health_and_social_exclusion_main_report.pdf [accessed 3 Nov. 2017]Singleton, N., Maung, N.A., Cowie, A., Sparks, J., Bumpstead, R., Meltzer, H. (2002). ‘Mental health of carers’. Cited in Social Exclusion Unit. (2004). ‘Mental health and social exclusion’. [online] London: Office of the Deputy Prime Minister. Available at: http://firststeptrust.org.uk/wp-content/uploads/2012/11/mental_health_and_social_exclusion_main_report.pdf [accessed 3 Nov. 2017].Social Exclusion Unit (2004). ‘Mental health and social exclusion’. [online] London: Office of the Deputy Prime Minister, p. 18. Available at: http://firststeptrust.org.uk/wp-content/uploads/2012/11/mental_health_and_social_exclusion_main_report.pdf [accessed 3 Nov. 2017]. Like homelessness, incarceration is a significant contributor to mental health issues:Halliwell, E., Main, L., Richardson, C. (2007). ‘The fundamental facts’. [online] London: Mental Health Foundation, p. 30. Available at: https://www.mentalhealth.org.uk/sites/default/files/fundamental_facts_2007.pdf [accessed 9 Aug. 2017].Paul Goggins, Minister for Prisons and Probation, speaking in a debate on prisons and mental health, Hansard, 17th March 2004. Cited in Prison Reform Trust. (2006). ‘Bromley briefings prison factfile’. [online] London: Prison Reform Trust, p. 27. Available at: http://www.prisonreformtrust.org.uk/uploads/documents/factfile1807lo.pdf [accessed 14 Aug. 2017].Paul Goggins, Minister for Prisons and Probation, speaking in a debate on prisons and mental health, Hansard, 17th March 2004. Cited in Prison Reform Trust. (2006). ‘Bromley briefings prison factfile’. [online] London: Prison Reform Trust, p. 27. Available at: http://www.prisonreformtrust.org.uk/uploads/documents/factfile1807lo.pdf [accessed 14 Aug. 2017].Fazel, S., Benning, R., Danesh, J. (2005). ‘Suicides in male prisoners in England and Wales, 1978–2003’. The Lancet, 366(9493), pp. 1301–1302. Available at: https://www.ncbi.nlm.nih.gov/pubmed/16214601 [accessed 14 Aug. 2017].Prison Reform Trust. (2004). ‘Prison reform trust factfile’. [online] London: Prison Reform Trust, p.10. Available at: http://www.cjp.org.uk/publications/archive/prison-reform-trust-factfile-10-12-2004/ [accessed 14 Aug. 2017].Lader, D., Singleton, N., Meltzer, H. (2000). ‘Psychiatric morbidity among young offenders in England and Wales’. [online] London: Office for National Statistics, p. 2. Available at: https://www.ncbi.nlm.nih.gov/pubmed/12745323 [accessed 14 Aug. 2017]. Worldwide, between 1/3rd and 1/2 of those affected by conflict, war, displacement, and natural disasters suffer from mental distress. The most common of these are:World Health Organisation. (2001). ‘Mental health: new understanding, new hope’. [online] Geneva: World Health Organisation, p. 43. Available at: http://www.who.int/whr/2001/en/ [accessed 9 Aug. 2017]. Below are some of the mechanisms which explain the effects on mental health that these difficulties can have. Living in difficult circumstances can be a huge source of long-term worry and stress, which is a well-known contributor to mental health issues. In the US, researchers at Carnegie Mellon University and Brandeis University have shown that financial stress is correlated with higher cortisol levels, which are in turn correlated with depression, anxiety, and insomnia.Talbot, S. (2007). The Cortisol Connection. 2nd ed. Alameda, CA: Hunter House, p. 13. On the biochemical level, chronic stress can disrupt the production of hormones and neurotransmitters, as well as regular gut function, which in turn affects our mental health.Mayer, E.A. (2000). ‘The neurobiology of stress and gastrointestinal disease’. Gut, 47, pp. 861–869. Less money and time for mental therapies, mind-body therapies, etc. Difficult environmental conditions can lead to chronic exposure to high levels of toxins through pollution in the air, water, the home, etc… Combined with a more limited access to nature and green spaces, and in conjunction with chronic stress, this can cause a substantial toxic overload which can negatively impact mental health. Research suggests that this is a ‘vicious circle’: homelessness is both a contributing factor to addiction and a result of it Alcohol Rehab. ‘Homelessness and substance abuse’. [online] Available at: http://alcoholrehab.com/drug-addiction/homelessness-and-substance-abuse/ [accessed 3 Nov. 2017]. How addiction and addictive substances and behaviours can impact your mental health.